Members of Mary Kay’s pink cult sometimes speak the truth so eloquently. Yesterday East Idaho News published a story about two MK sales directors receiving their pink Cadillacs on the same day. What a treat for Tammy Brown and Jenn Kirkham!!! Well, those Cadillac’s aren’t free, and they aren’t something beauty directors can win. With a unit of at least 30 women, those sweet rides are earned. They’re not exactly earned, dear author. All you have to do is recruit people and get them to buy inventory packages. No one has to sell a thing! 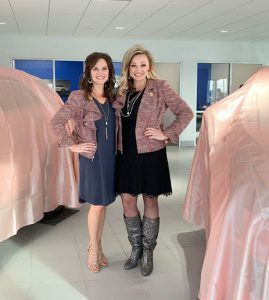 “There are thousands of women who earn Cadillacs every single quarter, but normally we just don’t get to pick them up together because they’re sent at different times,” Kirkham says. No, thousands of Cadillacs aren’t earned each quarter. Only 1,100 are on the road. Why can’t MK reps ever get the numbers right? Kirkham, who’s from Rigby, says the Cadillac is like a “trophy on wheels” as their unit has to sell over $200,000 of product within six months to earn the car. Kirkham should have said that they have to ORDER those products, but no one actually has to sell anything. And few sell much. “The pink Cadillac is the top of the pyramid of cars in Mary Kay,” Brown says. It’s hard to comment on the word “earned”. Exploitation, manipulation, coercion are words that come to mind. They always say the cars are earned through hard work. No, they’re given following successful untruths and manipulation in the recruiting process. Those boots. Hanious. The new Applause says only 9 people in the entire company earned the use of scar in July. Nine. Not even a thousand?! This is what I came to the comments for! I can’t believe that last said thousands a QUARTER!! The irony is rich… so is the cognitive dissonance. Just noticed the SD jackets… LOL LOL… hideous. Wait! They aren’t EVEN “earned”. Earned would mean it’s YOURS. Like you won it by hard work and earned it. But that isn’t the case at all. You have to keep “earning” it every month/6 months/qualification period for as long as you want to pretend you EARNED it! I went Googled news article and a different lady was getting a caddy. Interesting how far downhill MK has gone. Mk ladies, even red jackets, wore Jean’s-ripped ones at that. Real professional! Rofl! Caption: This is what 2 $900 monthly car payments look like.